While accomplished local trainer Sue Grills has sadly farewelled her stable and country star sprinter Fickly Folly, it’s business as usual with numerous strong contenders at Tuesday’s Tamworth TAB meeting. Sue has seven runners throughout a strong eight-race program at Tamworth, headed by performed sprinters Under the Thumb ($2.20 favourite on TAB fixed odds) and Boolaroo ($10). In particular, Under the Thumb has proved to be up to city midweek grade. “They do look my best chances, Under the Thumb has come back really well from a spell, he’ll be hard to in the Spring Cup and we also considered a Canterbury midweeker,” Sue assessed. “Boolaroo won well last start he’s just so consistent and races best with the sting out of the ground. Under the Thumb, placed at Canterbury Park and Warwick Farm last preparation, has been allocated 58.5kg in the Tamworth $22,000, 1200m feature with the significant booking of champion Greg Ryan. The race is sponsored by Easters Landscaping Supplies. Under the Thumb was solid in the market, ridden by Hugh Bowman when a creditable fifth at Warwick Farm three weeks ago behind talented Coruscate. The run followed a strong and unlucky first-up third in a Coffs Harbour feature. 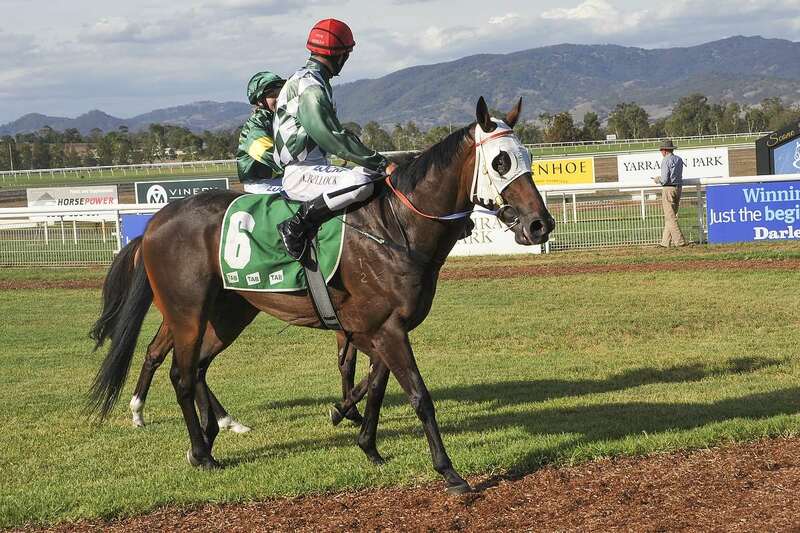 Boolaroo was third-up dominating a BM 66 (1400m) for his fifth career with at Tamworth three weeks ago. Boolaroo contests the RJN Transport 1600m with 56kg for Grant Buckley, up 2kg from his latest win. Grills is represented by restricted grade gallopers Kadarchi ($9) in race three, Onya Rosie ($11) in the fourth event, Arleta ($6.50) in race six, and finally Not a Princess ($16) in the last. Onya Rosie is going better than her form indicates she just keeps drawing out wide: “Arleta’s placing Scone was solid and she’s suited out to 1200m. Fickle Folly, Group-placed as a filly, had the outstanding record of six wins from 17 starts, including success at Royal Randwick and Warwick Farm when ridden by celebrated veteran Robert Thompson. Meanwhile, in-form trainer Kris Lees will be hard to beat in respective maiden races with debut runner Power Rush ($3.10 fav) who has trialled nicely at Gosford and Think Free ($2.40 fav) off a Taree placing. Tamworth is rated a soft six surface at present with fine weather predicted.